Well, what can I say about my experience with MMV… Fantastic! From the very first contact with Katie to the after surgery care, everything has far exceeded my hopes. Pre-surgery. Thank you, Betty, for all your work in coordinating my labs visits, hospital stay etc. You are so kind and compass mate. Fr. Valdez, you are amazing. I was so impressed by my pre-surgery consultation with you. You’re through, meticulous explanation of the procedures and process answered every question I had (and didn’t know I had) and gave me so much confidence. 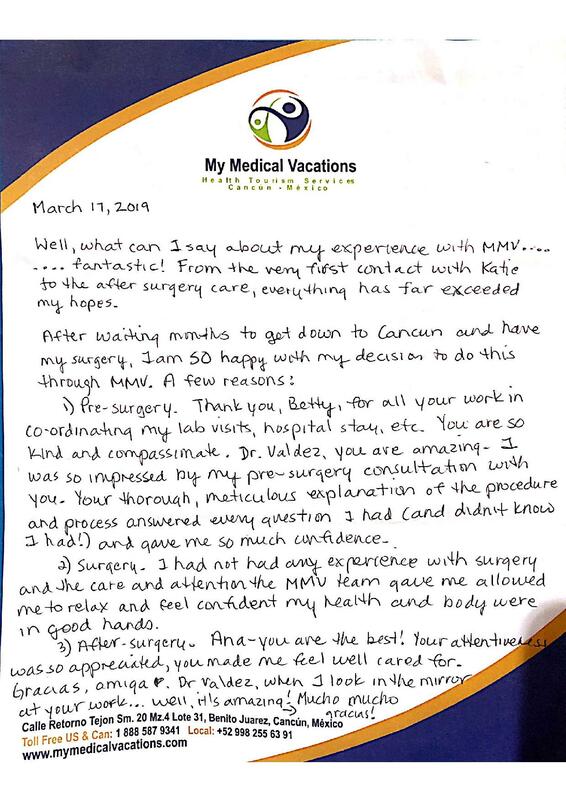 I had not had any experience with surgery and the care and attention the MMV team gave me allowed me to relax and feel confident my health and body were in good hands. After surgery. Ana-you are the best! Your attentiveness as so appreciated, you made me feel well cared for. Gracias amiga<3 Dr. Valdez, when I look in the mirror at your work… well, it’s amazing! Mucho mucho gracias!